Robin – A Bunny With Nine Lives! Special thanks go out to HRN volunteer and foster Mom, Robin, for putting together this blog entry! Robin is a true survivor. She was one of eight rabbits dumped on the side of a road near busy I-495 and Route 2 in Massachusetts. Her story along with the other rabbits made news headlines. They were rescued, but Robin was going to be euthanized because one of her eyes is malformed. Luckily, she was saved from that sad fate by the House Rabbit Network. Robin now enjoys another chance at life with a foster home. Although one eye is smaller, she sees fine and hops, eats and begs for treats just fine! Robin is a Florida White bunny. She has good litter box habits and will come up to you for food. She is cuddly and doesn’t seem to mind being held close. Robin is hoping someone with a big heart will give this beautiful survivor a loving, forever home! Call our hotline number, 781-431-1211, and arrange your visit with Robin today! Hobbs- Average Bunny or Binky Maniac? UPDATE: Hobbs has continued to grow and turn into an even more loveable bun. Although he’s definitely growing up, his youthful energy is still in full force and the binkies are getting even better. He’s also starting to be a super bunny-500 sprinter, though he hasn’t quite figured out his brakes yet and sometimes, quite adorably, runs full speed into things. His personality is definitely shinning through. This bun is so explorative and playful, and he cannot be stopped. Hobbs finds his way into everything and anything that interests him. He loves playtime and thoroughly uses it to explore as much as possible. The best change in Hobbs has been his demand for attention! He was always a friendly bun, but now we can’t have him out without him jumping on to the couch and demanding some major attention. And with his soft fur, you can’t resist patting him as long as he wants. Hobbs is still waiting for his forever home. So if you want a young, fun, energetic bun who demands your love, give the hotline a call and ask about Hobbs! What’s black and white and binkies all over? Hobbs! Hobbs is quite the growing boy. He may seem like your average adorable rabbit, but after just a few minutes with him, you’ll learn that he’s a binky maniac. Hobbs has all the energy of a rabbit his age (about 5months) and then some… and then some more! No matter what space he’s in, he finds a way to get his binky fix-whether it’s back and forth on the small shelf in his cage or in the wide open play room. I’ve even seen him binky up the side of his cage Matrix style! Physics is apparently no match for Hobbs. Out time is obviously filled with endless binkies and sprinting around. He’s very very explorative and is always trying to get into new rooms. In his adventures, he does also enjoy exploring wires- his forever home should be thoroughly bunny-proofed. His energy does eventually run out and Hobbs will usually seeks some table to flop out underneath and catch his breath before the next round. Despite his seemingly endless energy, Hobbs does also enjoy smooshing down for some good pats. He’s very comfortable with people petting him. However, he really does not like heights, like most rabbits, and struggles when being carried. But with all four on the floor, he does really well with being handled. His litter box habits are great and his growing body loves food. 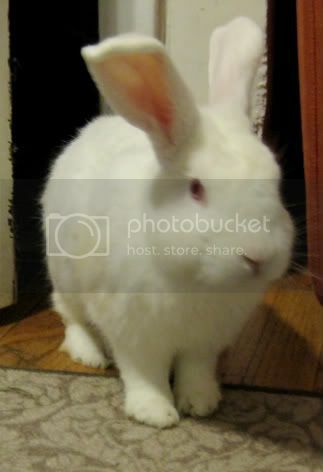 Hobbs is a sweet, energetic, loving bun who will make a great addition to any household. His youth makes him exciting to watch and his outgoing personality holds great potential for a strong relationship with his forever family. Do you like soft, sweet, energetic bunnies and have a house with great running room for this binky master? Is so, give the hotline a call- Hobbs could be the fun for you! Autumn and Amber may be small, but what they lack in size, they make up for in character. This pair of ladies are sweeties! They’re a little timid at first, but really enjoy exploring…as long as they’re together. They’re very strongly bonded and rarely leave each other’s sides. Amber is part jersey wooley, and commonly known as “Squish Face” for that adorable fur-hidden grin. We’re not sure if there’s a chin under all that fur either, but that’s OK. Her unusual appearance makes her fun to watch. Don’t be fooled by her bug eyes- even when she’s flopped out resting or chowing down on her greens, those eyes look like they’re about to jump out. She’s shedding right now (as you can see the growing patch of new fur on her back), but her new fur is growing in nicely. In the meantime, she looks extra extra funny. All her little quirks add up to one adorable bunny. Autumn isn’t quite as unique looking as her partner, but has a gorgeous silvery coat. She’s the more explorative of the two and usually is the one to initiate adventure time. She’s a sweet girl who takes great care of Amber, grooming her often. Autumn is a little vocal at times when she doesn’t want you in messing around in her cage. Both girls are pretty timid, but it’s really nice to see what comfort they find in each other. They would do well in a calmer home where their forever family could work on building a strong relationship. They have good litterbox habits and absolutely LOVE their hay. They enjoy their out time a lot- Autumn binkies often and Amber occasionally joins in as well. They’re also pretty good around furniture and would probably do well free-range. This pair may be a bit shy, but they’ll work their way into your heart before you know it. Their strong bond and unique appearance make them a joy to watch.